If you can’t find the exact gradient you need, you can easily create your own. The Gradient Editor lets you create your own custom gradient using as many colors as you want. After you create a custom gradient, you can save it as a preset to reuse in the future. 1Select the Gradient tool from the Tools panel. It looks like a rectangle that goes from black on the left to white on the right. 2Click the Edit button in the Tool Options. The Gradient Editor dialog box opens, as shown in the figure. 3Pick an existing preset to use as the basis for your new gradient. See the figure for an example of each type. If you want to choose a gradient from a different Preset library, select that library from the Preset drop-down menu. 4Choose your gradient type, either Solid or Noise, from the Type drop-down menu. A Noise gradient contains random colors. Interestingly, each time you create a Noise gradient, the result is different. Note that as soon as you start to edit the existing gradient, the name of the gradient changes to Custom. 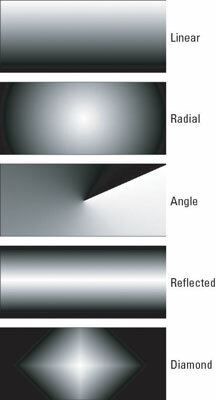 If you chose Solid, adjust the Smoothness percentage to determine how smoothly one color blends into another. If you chose Noise, you can choose which Color Model to use to set the color range. You can also adjust the Roughness, which affects how smoothly or abruptly the color transitions from one to another. Click Restrict Colors to avoid oversaturated colors. The Add Transparency option adds transparency to random colors. Click the Randomize button to randomly generate a new gradient. You can then skip to Step 13 to finish the gradient-making process. 6If you’re creating a solid gradient, choose the first color of your gradient by double-clicking the left color stop under the gradient bar. The triangle on top of the stop turns black to indicate that you’re working with the starting point of the gradient, and the Color Picker appears so that you can then choose your desired color. In the Stops area, you can also single-click the left color stop and then click the Color swatch to access the Color Picker. If you click the Color down-pointing arrow, you access the Color Swatches drop-down menu, where you can choose from various Preset Swatch libraries from the top of the panel. 7Select the ending color by double-clicking the right color stop. Repeat the process in Step 6 to define the color. 8Change the percentage of one color versus the other by moving the starting or ending point’s color stop to the left or right. 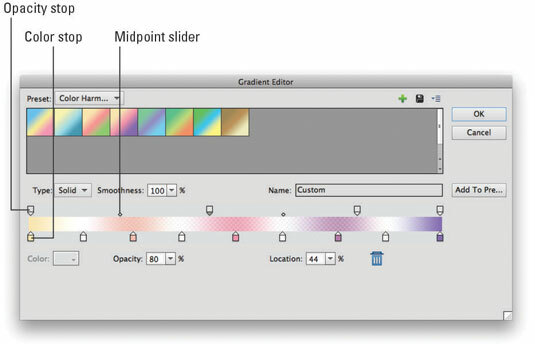 Drag the midpoint slider (a diamond icon) to where the colors mix equally, 50/50. You can also change the position of the midpoint by typing a value in the Location box. 9To add another color, click below the gradient bar at the position you want to add the color. Define a color in the same way you did in Steps 7 to 9. 10Repeat Step 10 to add colors. 11To add transparency to your gradient, select an opacity stop (refer to the figure). Adjust the Opacity slider to specify the amount of transparency you desire. By default, a gradient has colors that are 100-percent opaque. You can fade a gradient to transparency so that the portion of the image under the gradient shows through. You can also add opacity stops in the same way you add color stops. 12Adjust your color and opacity stops and their midpoint sliders to vary the percentages of each color. You can also redefine any of the colors. To delete a color stop, drag it up or down off the gradient bar. 13When you’re done, name your gradient and click the New button. Your gradient is added to the Presets menu. After all that work, you may want to consider saving your gradients for later use. To save a gradient, click the Save button in the Gradient Editor dialog box. Save the current presets, with your new gradient, under the current library’s name or a new name altogether. You can later load that preset library. You can also manage your gradient presets with the Preset Manager.